Our Maltys Chocolate is a combination of chocolate & malt which is purely delectable. 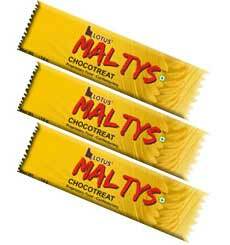 Maltys Chocolate is the only Indian chocolate with a blend of malt. The best malt grains are selected and a strict quality controlled procedure is followed to ensure that the ingredients to be finally blended with chocolate are well-suited to bring out the true essence of both the chocolate and the malt. Our Maltys Chocolate is a winning combination of health and taste.